These little trackers are EVERY WHERE!!! I knew these were cool before the world did. I used to wear a pedometer that was the size of a pager - for those of you that are old enough to remember pagers when they were all the rage... before cell phones even existed. & when these little gadgets came out, I was on board to upgrade my heavy hip-bearing pedometer to a little electronic wonder. Enter into my life my FitBit One. I have loved everything about it. Seriously. I have recommended it to everyone. I panic when I loose it on my clothes. I can't live without it. & then I kept seeing all these wrists trackers popping up & wondered how they worked. 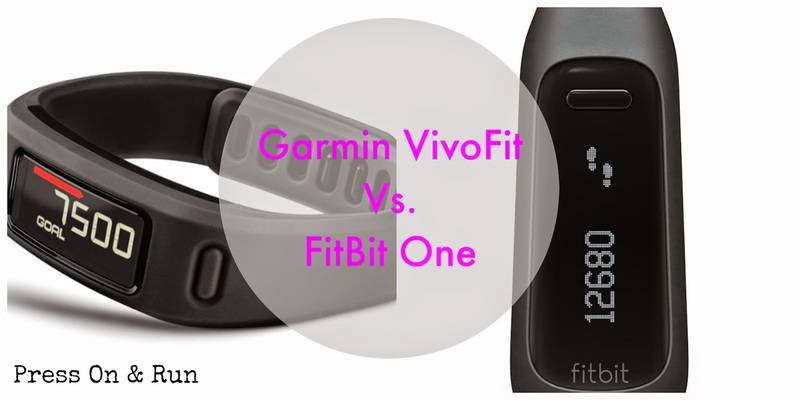 I was never planning on getting another one until my FitBit One conked out.. but then that dang Amazon had to go do a Deal of the Day on the Garmin Vivofit for $59.00 ... heck, I spend $59.00 at Starbucks in a week... not really... kinda.... so went ahead & ordered it. * It seems pretty dang accurate. It was actually listed in the top 3 of the most accurate pedometers because it is on the waist, along with the FitBit Zip. * Love the ease of finding people & friending them on the app. * Waterproof. Love I don't have to ever take it off. * Red Line shows when haven't moved in awhile - a great motivator to get moving. * Does not count steps when pushing basket/stroller, cutting grass or holding a purse & arm is not swinging, or walking while holding something. I really hate that the Garmin Vivo Fit is weird on how it counts & doesn't count steps. I will go in the grocery & push the cart & it doesn't count me but going a few steps the whole time. Can you imagine if you were in Disney World pushing a stroller all day & it took you for doing like 2000 steps for the day? nooooo!!!!! I even cut the grass with it on & walked for 35 minutes & it only counted me doing 100 steps the entire time. That's really not cool. But I will say, when it wouldn't count those steps where the arms aren't moving & my FitBit would continue to count my steps, it actually sort of even-ed out the playing field making them almost even. & I'm not even sure how this worked, but when I went for my run for my 10k, the Garmin counted LESS steps then my FitBit... probably because with my shoulder injury, I try to minimize my arms from swinging. Day 5 - 16,542 / 14,094 / <2448> ... this was my 10K??? As you can see - there is no rhyme or reason to the difference!!!! Some days were really close... but the majority is around 2,000 steps difference. & they both have great things about them... both have flaws. I'm not even sure I could pick a favorite if I had to because I like them both for different reasons. I would say I would pick my FitBit for Accuracy. I would pick my Garmin for Convenience. I just know they keep me moving... & that's not a bad thing. For the record, I'll probably always wear both until one of them bombs or I make the jump to the ones that have the heart rate monitors built into them... I obviously am a number person so I will enjoy the comparison thing for awhile. Do you have a Fitness Tracker? Which brand/kind do you prefer? I have a pedometer, but seldom wear it. I really need to get it back out. We got our daughter a Fitbit for Christmas. I don't know if she uses it or not. I have a FitBit Flex (a Christmas present from my mother-in-law ... what's she trying to tell me? - just kidding ... I LOVE IT!) and have worn it daily since getting it. I absolutely LOVE FitBit's customer service as this is actually my third tracker in 5 1/2 months. The first one flat-out died, second one didn't charge at all, this one's been working great and I receive the replacement within the week of reporting the issue. A friend of mine has the Zip and bought a wristband for it so it works like a Flex but looks more like a watch -- wonder if that would work for the One? FitBit challenges are great at keeping me motivated too. Keep on walkin'! I like my FitBit One on my waist - those tend to be the most accurate. But I do love the convenience of the wrist. So I'll just keep sporting them both for now :) ... I do love Fitbit's Customer Service as well - I've only heard great things from so many about issues they take care of. I have the fit bit one, and i love it. I don't like wearing things on my wrist since it bangs all day when I type at work. I wear mine on my bra everyday facing in. Never had any issues losing it yet. Interesting that they tracked differently. Thank you for your comparisons. I don't have anything to count my steps. I do have a pedometer somewhere! I tried the fitbit but sent it back...I am just not motivated by counting my steps. But I did love the sleep app on it, that was pretty cool. I had no idea you had another blog. How do you do it all?? You amaze me! I got my dad a Fitbit for his birthday, which my mom proceeded to steal. I'm almost afraid to see how many few steps I take a day though. I love my Fitbit One! I should probably not admit this, but I wear it on my underwear when I don't have pockets :) I also wear it on my underwear at night (instead of using the arm band) because the arm band kept getting snagged on the blankets & coming off (or the fitbit would slide out & I'd have to dive back into the bed to find it in the morning. If you're searching for the best Bitcoin exchange service, then you should use CoinMama. At Moon Bitcoin you may recieve free satoshis. 163 satoshi every 1 hour.